PC Gamer represents all that was awesome about games journalism in the '90s, now sadly diminished. Brilliant, funny, full of integrity, and solid print sales were always present, and with the tragic exception of the latter, still are. Video game magazines were hit harder than nearly any other magazine vertical when the internet began its uncoordinated, but inevitable assault on print media. Magazines are now struggling to find their place in a world filled with more competitors than paying customers. A virtual tour of a Team Fortress 2 map, complete with helpful tips for optimum pwnage. A guide to 3D graphics terminology that uses sliders to allow readers to turn various 3D effects on and off in screenshots of games to see what exactly they do. A game developer roundtable discussion where viewers can arrange the order of the interview questions themselves. A competition between the three main PC Gamer editors (below), where each plays through a section of a game using a different style. Each contains assorted other fun content as well. I was skeptical of PC Gamer Digital when it was first announced during PAX Prime at the PC Gamer press conference. It's far from the first digital magazine, and most of those haven't been very successful. But PCD has a lot going for it that many of its forebears did not. First, it's available on Steam. Not only is that where most PC gamers get their games anyway, which means it's very accessible, but the $2 price point makes each issue a no-brainer impulse buy for someone buying a much more expensive game on their credit card at the same time. Beyond trifling issues like format and price, the content of the first two issues is really well done. It's funny, informative, and features stunning production values. All the cameras used are as HD as can be. 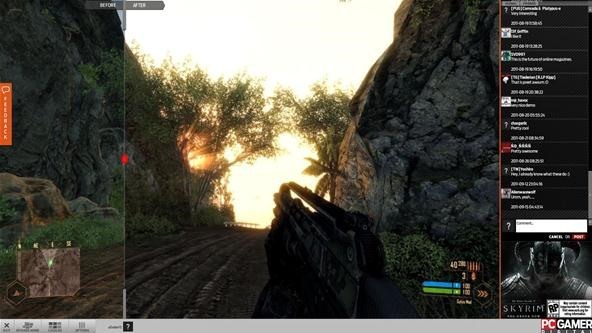 The interface is sleek, easy-to-use, and stylistically unified with Steam's. And the 3D graphics demos have made clear concepts like Antistropic filtering, which I have long struggled to understand. It is a really nice package, and I hope it succeeds at reviving its former game journalism glory days.